Rice & Rose attorney Paul Rice is pictured here with Volusia County Sheriff Ben Johnson minutes before the start of the first of the 2012 Gatorade Duels. 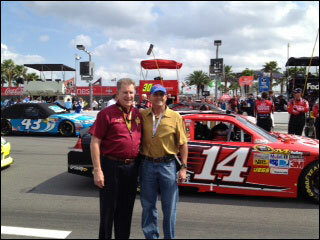 Mr. Rice, an avid NASCAR fan, and Jim Rose attended the Gatorade Duels at the Daytona International Speedway on February 23, 2012 as guests of the Daytona Beach/Halifax Area Chamber of Commerce. Not coincidentally, Mr. Rice posed in front of the car of his favorite driver, Tony Stewart. A great time was had by all of the Chamber executives and guests, especially Mr. Rice who watched Tony Stewart win the first Duel.